Forklifts come in a variety of size, power, and fuel options. The following guidelines will help you choose the forklift rental that is right for your project, while keeping you safe on the job. Standard tires are sufficient for indoor work while outdoor jobs may require rough-terrain or pneumatic tires. 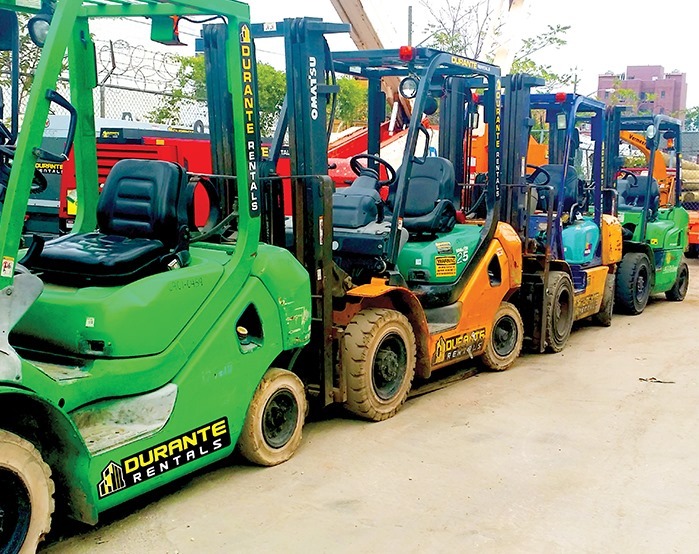 The forklift's fuel source and engine type are also extremely important. Internal combustion engines offer more power but are not suitable for indoor operation or in poorly ventilated areas. When working indoors, you should stick to LPG (propane) or electric powered forklifts. Forklift manufacturers affix a “Load Capacity Plate” to each machine. 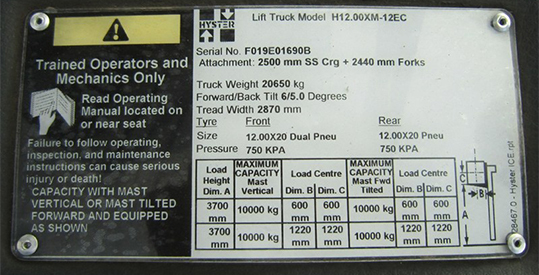 This plate shows the maximum weight or “rated capacity” your forklift can safely lift. Forklift operators should be familiar with their rental forklift's “rated capacity”. Always confirm that all safety features are fully functional. Make sure the overhead Falling Object Protective Structure (FOPS) protecting the driver is intact, seat-belts are functional and a proper speed control device is fitted to your forklift. The horn, back-up alarm, proximity indicator, and lights should regularly be checked to ensure they are fully functional. One of the main causes of forklift-related injuries are collisions with people. Forklift operators should take the following steps prior to the start of each new project. Designate operating zones that are separate from pedestrian zones. These operating zones should be cordoned off with high-visibility barriers. Walkways should be provided to allow pedestrian traffic through work areas. Traffic management plans should be put into place to prevent collisions by separating machines by time or space. These plans should be indicated with signage placed in centralized areas. Employees should be made aware of these zones/walkways and should be updated to changes as they occur. Signs and mirrors should be installed at all blind spots. Hazards such as docks or ramp edges should be clearly marked. Forklift operators should have certified forklift training (call 1-800-DURANTE) or be within the sight lines of a certified supervisor. 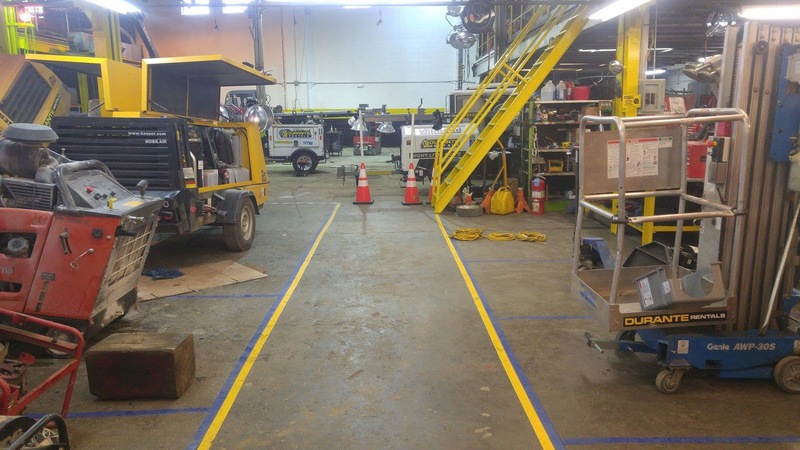 Operators should be aware of the layout and paths in their “operating zone”. They should always wear seat belts and be aware of hazard signs. Operators should also be mindful of speed limits and should report any damage or incidents while on duty. All forklifts in your fleet should be regularly maintained, inspected, and cleaned. Any issues should be recorded and repaired. Pre-operational checklists should be filled out at the beginning of each day. 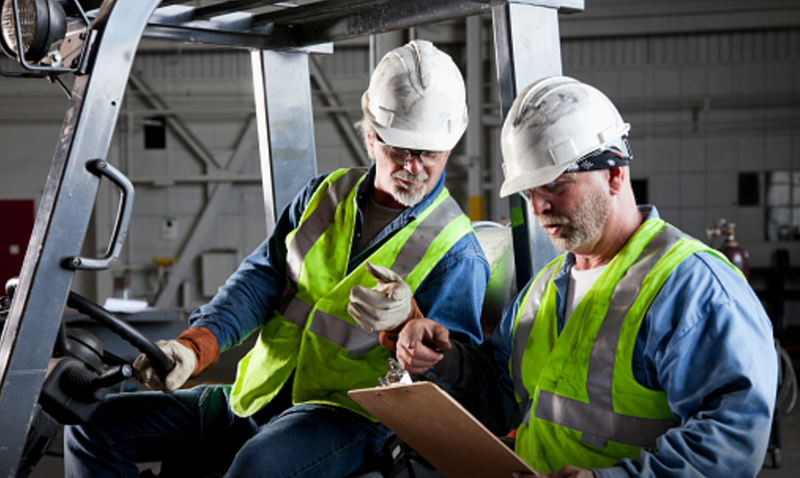 These checklists should be tailored to fit the brand of your forklift and your project’s needs. Forklifts in need of service or repair should be immediately removed from the jobs-site until the necessary repairs can be made. Now that you have the right forklift, your job-site is “forklift friendly”, your operators are trained, and your forklift is in good working order - it's time to get to work. To ensure all safety procedures are followed, operators should be supervised at all times. Hazards like ramps, ledges, or drains, may unbalance your forklift. These hazards should be well marked and avoided at all costs. Managers should allow enough time for operators to complete their projects at safe speeds. Work smarter, not faster. When loading, unloading, and travelling, all loads should be checked for stability. Operators should be mindful of their forklift's weight limits and should never exceed these capacities. Travel with loads should only be attempted when the forks are down. 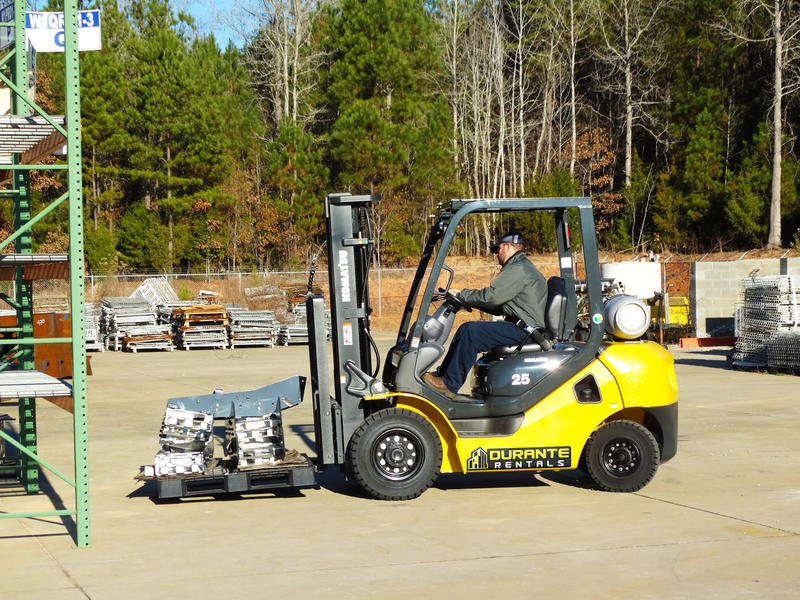 Finally, procedures for recharging and refueling your forklift should be followed. These are just a few safety tips to keep in mind when operating your forklift rental at maximum safety levels. 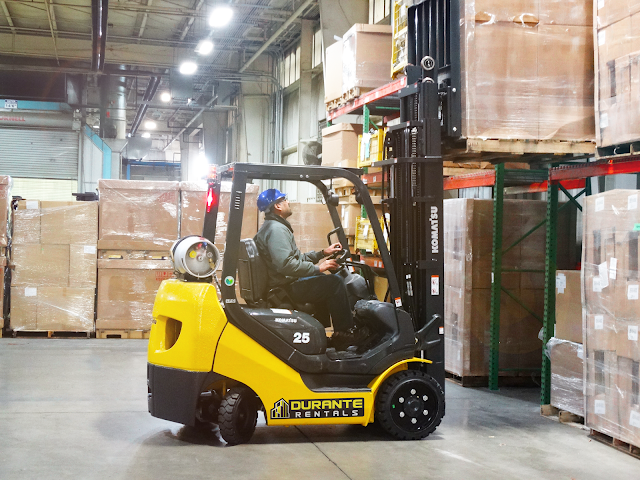 For questions, or to inquire which type of forklift rental your job requires, call 1-800-DURANTE or check our our forklift rental website.